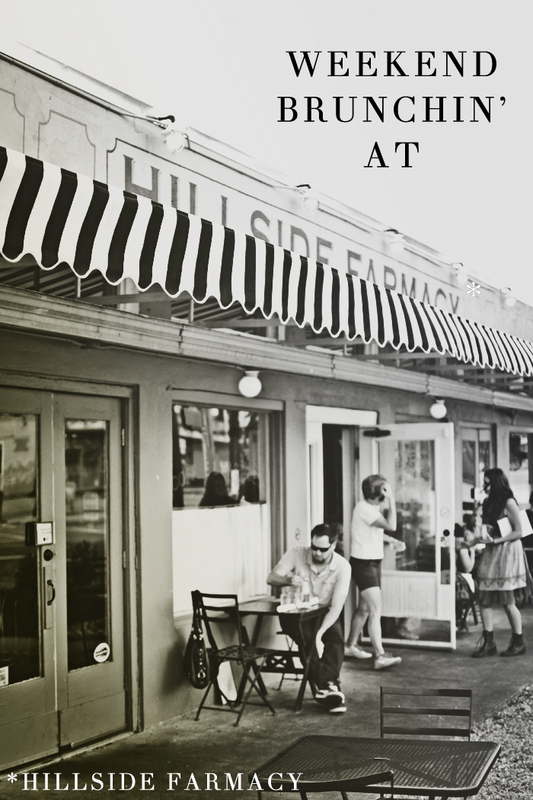 I love Hillside Farmacy - it's one of my fave places to dine at in East Austin. What's not to love about a place where some staff members wear lederhosen and big wooly socks with shorts? It's like Inglourious Basterds-meets-Top Chef....a beautiful mash-up of sights and flavors, I will tell you that much. Let's take a minute to talk about the menu. It's simple food that lets the homemade or fresh ingredients do the talking....and talk they do. I was practically drooling over the entire brunch menu. Bruleé grapefruit; croque monsieur; bread pudding french toast; Texas watermelon salad with cherry tomatoes, cucumbers, and riccotta salada; macaroni & cheese “carbonara” with peppered bacon, hen egg, mornay & fresh herbs; smoked salmon with lavender honey, capers, fennel, and house slaw....it basically came down to a quick eenie meenie minie mo because I looked up from my menu and saw the top left face below staring back at me. Yep, I had committed the cardinal sin of not making either one of us breakfast...and let me tell you, when John's blood sugar takes an gold-medal worthy dive, he lets me know about it (and I secretly think it is adorable when he gets a bit grumpy). Like a modern day Snow White and her 7 dwarfs, we instead had Hillside Farmacy and the 6 stages of low-blood sugar. Luckily, there wasn't enough time to act like total freaks since the food arrived lickety-split after we placed the order. John practically inhaled his "big brekkie" - scrambled eggs, bacon, skillet potatoes, and toast. I may or may not have swooped in and stole some taters when he wasn't looking. Into my belly went the smoked salmon with lavender honey, capers, fennel, and house slaw. To say I enjoyed every bite is an understatement. Can't wait to go back. The faccia bedda sandwich with smoked mozzarella, roasted red bell pepper, arugula, tomato, red pepper flakes is calling my name. Nom nom nom. Won't regret it, that I can promise. 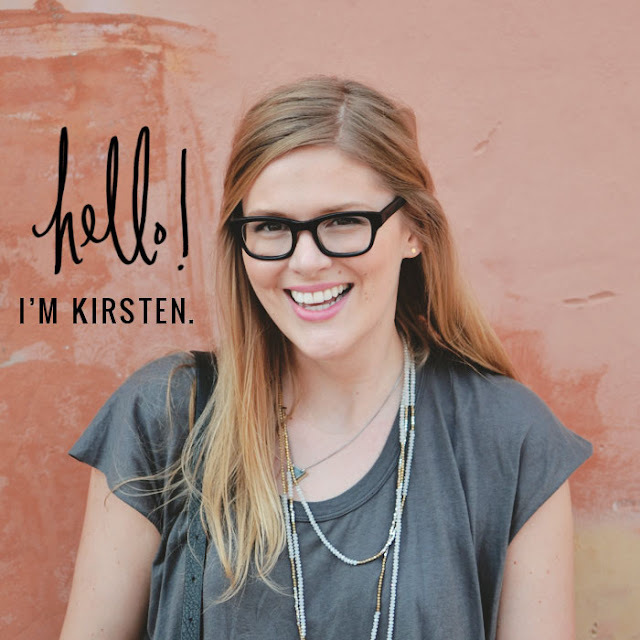 I've totally been wanting to go on a trip to Austin and I think this just convinced me that it needs to be sooner rather than later! That salmon plate looks delicious. Everything looks yummy! I will have to make the drive to Austin soon! I'm only a hop, skip, jump away in good ol' San Antonio. This looks DELICIOUS. I'm such a sucker for brunch. I love living 3 blocks from here. I really do. BAHAHAHA! 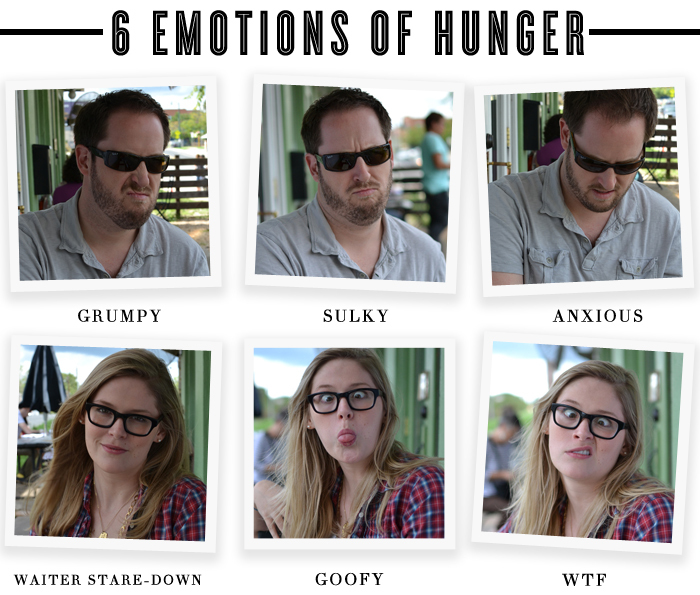 LOVE the emotions of hunger!!! !